I can't believe it is Friday already! It was our first full week back after our holiday so we needed to get back into the routine. A great Canadian icon died this week, Stuart McLean. 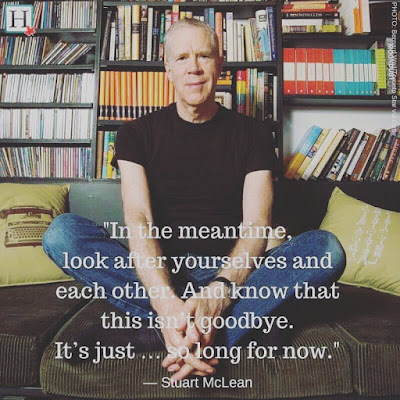 He was a pillar of CBC Radio and a fixture of many people's Sundays with his show The Vinyl Cafe. Dave and I both listened to the show with our parents when we were growing up and continued to enjoy Stuart's stories together. Almost like Seinfeld, reference to one of his stories will come up nearly everyday, for example, whenever I see the blood pressure machine at Shoppers, I think of Dave getting his arm stuck. I was trying to think of my favourite Dave and Morley story, but it was hard to narrow it down. I felt like Morley sometimes, like when she came home to find the kitchen in disarray. We liked that Dave came from Cape Breton. We could picture them living down the street in our own Toronto neighbourhood. Everyone likes the turkey story, but I preferred Polly Anderson's Christmas party when Sam and the rest of the kids drink the spiked egg nog, and meanwhile "Dave had had four glasses of egg nog but couldn't seem to loosen up". Not only with those stories, but the others he told about Canadian towns, or his voice reading others' stories in the Story Exchange, Stuart had the unique ability to make you laugh, smile with melancholy, or put a lump in your throat, all in one story. We will dig out the CDs that are in the car and listen to them with joy. So long for now, Stuart. 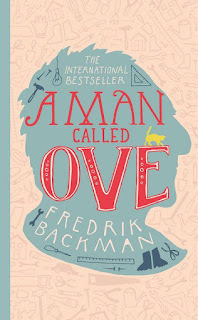 I read A Man Called Ove when we were in Jamaica. This book was up for consideration for our book club this year, but we didn't select it. When I saw it at the library I thought I'd try it out as a beach read. It was really good! I would recommend it if you haven't read it yet. It made me laugh out loud and also cry, so I guess it is a good beach read so you can hide behind your sunglasses! Apparently there is also a Swedish movie of this book, and it's playing in Toronto right now! E got these little Star Wars figurines for Christmas to accompany his Millennium Falcon. There are 10 in the package. They are so great. I would recommend them for your little Star Wars fan. There are good guys and bad guys, with quite a bit of detail, but they are sturdy. Q has been grasping them lately and even he likes them. We celebrated Valentine's Day with some of our favourite things - themed food, lunch at the Drake, and cupcakes from Bake Sale. You can read about our day here. My favourite thing to do is go on vacation, bonus if the sun is shining and there is a beach! Read about our trip to Jamaica here. Enjoy your long weekend if you're in a province where we have the February holiday! We aren't sure exactly what we are going to do, but the temperatures look warm so we will be outside for sure.